AMEVIVE® (alefacept) is an immunosuppressive dimeric fusion protein that consists of the extracellular CD2-binding portion of the human leukocyte function antigen-3 (LFA-3) linked to the Fc (hinge, C H 2 and C H 3 domains) portion of human IgG1. Alefacept is produced by recombinant DNA technology in a Chinese Hamster Ovary (CHO) mammalian cell expression system. The molecular weight of alefacept is 91.4 kilodaltons. AMEVIVE® is supplied as a sterile, white-to-off-white, preservative-free, lyophilized powder for parenteral administration. After reconstitution with 0.6 mL of the supplied Sterile Water for Injection, USP, the solution of AMEVIVE® is clear, with a pH of approximately 6.9. AMEVIVE® is available in two formulations. AMEVIVE® for intramuscular injection contains 15 mg alefacept per 0.5 mL of reconstituted solution. AMEVIVE® for intravenous injection contains 7.5 mg alefacept per 0.5 mL of reconstituted solution. Both formulations also contain 12.5 mg sucrose, 5.0 mg glycine, 3.6 mg sodium citrate dihydrate, and 0.06 mg citric acid monohydrate per 0.5 mL. AMEVIVE® interferes with lymphocyte activation by specifically binding to the lymphocyte antigen, CD2, and inhibiting LFA-3/CD2 interaction. Activation of T lymphocytes involving the interaction between LFA-3 on antigen-presenting cells and CD2 on T lymphocytes plays a role in the pathophysiology of chronic plaque psoriasis. The majority of T lymphocytes in psoriatic lesions are of the memory effector phenotype characterized by the presence of the CD45RO marker 1 , express activation markers (e.g., CD25, CD69) and release inflammatory cytokines, such as interferon (gamma). AMEVIVE® also causes a reduction in subsets of CD2+ T lymphocytes (primarily CD45RO+), presumably by bridging between CD2 on target lymphocytes and immunoglobulin Fc receptors on cytotoxic cells, such as natural killer cells. Treatment with AMEVIVE® results in a reduction in circulating total CD4+ and CD8+ T lymphocyte counts. CD2 is also expressed at low levels on the surface of natural killer cells and certain bone marrow B lymphocytes. Therefore, the potential exists for AMEVIVE® to affect the activation and numbers of cells other than T lymphocytes. In clinical studies of AMEVIVE®, minor changes in the numbers of circulating cells other than T lymphocytes have been observed. In patients with moderate to severe plaque psoriasis, following a 7.5 mg intravenous (IV) administration, the mean volume of distribution of alefacept was 94 mL/kg, the mean clearance was 0.25 mL/h/kg, and the mean elimination half-life was approximately 270 hours. Following an intramuscular (IM) injection, bioavailability was 63%. At doses tested in clinical trials, AMEVIVE® therapy resulted in a dose-dependent decrease in circulating total lymphocytes 2 . This reduction predominantly affected the memory effector subset of the CD4+ and CD8+ T lymphocyte compartments (CD4+CD45RO+ and CD8+CD45RO+), the predominant phenotype in psoriatic lesions. Circulating na[iuml ]ve T lymphocyte and natural killer cell counts appeared to be only minimally susceptible to AMEVIVE® treatment, while circulating B lymphocyte counts appeared not to be affected by AMEVIVE® (see ADVERSE REACTIONS , Effect on Lymphocyte Counts ). AMEVIVE® was evaluated in two randomized, double-blind, placebo-controlled studies in adults with chronic (>/=1 year) plaque psoriasis and a minimum body surface area involvement of 10% who were candidates for or had previously received systemic therapy or phototherapy. Each course consisted of once-weekly administration for 12 weeks (IV for Study 1, IM for Study 2) of placebo or AMEVIVE®. Patients could receive concomitant low potency topical steroids. Concomitant phototherapy or systemic therapy was not allowed. In Study 1, patients were randomized to receive one or two courses of AMEVIVE® 7.5 mg administered by IV bolus. The first and second courses in the two-course cohort were separated by at least a 12-week post-dosing interval. A total of 553 patients were randomized into three cohorts (Table 1). Study 2 provided a basis for comparison of patients treated with either 10 mg or 15 mg AMEVIVE® IM. One hundred seventy-three patients were randomized to receive 10 mg of AMEVIVE® IM, 166 to receive 15 mg of AMEVIVE® IM, and 168 to receive placebo. Table 2 shows the treatment response in the first course of Study 1 and Study 2. Response to treatment in both studies was defined as the proportion of patients with a reduction in score on the Psoriasis Area and Severity Index (PASI) 3 of at least 75% from baseline at two weeks following the 12-week treatment period. PGA "almost clear" or "clear"
1 Cohorts 1 and 2 are combined. In Study 2, the proportion of responders to the 10 mg IM dose was higher than placebo, but the difference was not statistically significant. In both studies, onset of response to AMEVIVE® treatment (at least a 50% reduction of baseline PASI) began 60 days after the start of therapy. 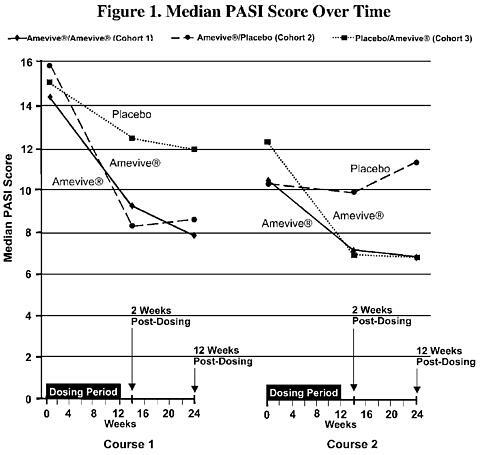 With one course of therapy in Study 1 (IV route), the median duration of response (defined as maintenance of a 75% or greater reduction in PASI) was 3.5 months for AMEVIVE®-treated patients and 1 month for placebo-treated patients. In Study 2 (IM route), the median duration of response was approximately 2 months for both AMEVIVE®-treated patients and placebo-treated patients. Among responders in study 1 who received AMEVIVE® 7.5 mg IV or in study 2 who received AMEVIVE® 15 mg IM and were followed off active treatment before AMEVIVE® retreatment, a 50% or greater reduction in PASI was maintained for a median of 7 months. Patients in Study 1 who had completed the first IV treatment course were eligible to receive a second treatment course if their psoriasis was less than "clear" by PGA and their CD4+ T lymphocyte count was above the lower limit of normal. The level of response (decrease in median PASI score) over the two courses of IV treatment is shown in Figure 1. The median reduction in PASI score was greater in patients who received a second course of AMEVIVE® treatment (see Cohort 1) compared to patients who received placebo (see Cohort 2). Data on the safety and efficacy of AMEVIVE® treatment beyond two courses are limited. AMEVIVE® should not be administered to patients with known hypersensitivity to AMEVIVE® or any of its components. AMEVIVE® INDUCES DOSE-DEPENDENT REDUCTIONS IN CIRCULATING CD4+ AND CD8+ T LYMPHOCYTE COUNTS. A COURSE OF AMEVIVE® THERAPY SHOULD NOT BE INITIATED IN PATIENTS WITH A CD4+ T LYMPHOCYTE COUNT BELOW NORMAL. THE CD4+ T LYMPHOCYTE COUNTS OF PATIENTS RECEIVING AMEVIVE® SHOULD BE MONITORED WEEKLY THROUGHOUT THE COURSE OF THE 12-WEEK DOSING REGIMEN. DOSING SHOULD BE WITHHELD IF CD4+ T LYMPHOCYTE COUNTS ARE BELOW 250 CELLS/µL. THE DRUG SHOULD BE DISCONTINUED IF THE COUNTS REMAIN BELOW 250 CELLS/µL FOR ONE MONTH (SEE DOSAGE AND ADMINISTRATION ). AMEVIVE® may increase the risk of malignancies. Some patients who received AMEVIVE® in clinical studies developed malignancies ( see ADVERSE REACTIONS , Malignancies ). In preclinical studies, animals developed B cell hyperplasia, and one animal developed a lymphoma ( see PRECAUTIONS , Carcinogenesis, Mutagenesis, and Fertility ). AMEVIVE® should not be administered to patients with a history of systemic malignancy. Caution should be exercised when considering the use of AMEVIVE® in patients at high risk for malignancy. If a patient develops a malignancy, AMEVIVE® should be discontinued. AMEVIVE® is an immunosuppressive agent and, therefore, has the potential to increase the risk of infection and reactivate latent, chronic infections. AMEVIVE® should not be administered to patients with a clinically important infection. Caution should be exercised when considering the use of AMEVIVE® in patients with chronic infections or a history of recurrent infection. Patients should be monitored for signs and symptoms of infection during or after a course of AMEVIVE®. New infections should be closely monitored. If a patient develops a serious infection, AMEVIVE® should be discontinued (see ADVERSE REACTIONS , Infections ). Patients receiving other immunosuppressive agents or phototherapy should not receive concurrent therapy with AMEVIVE® because of the possibility of excessive immunosuppression. The duration of the period following treatment with AMEVIVE® before one should consider starting other immunosuppressive therapy has not been evaluated. The safety and efficacy of vaccines, specifically live or live-attenuated vaccines, administered to patients being treated with AMEVIVE® have not been studied. In a study of 46 patients with chronic plaque psoriasis, the ability to mount immunity to tetanus toxoid (recall antigen) and an experimental neo-antigen was preserved in those patients undergoing AMEVIVE® therapy. Hypersensitivity reactions (urticaria, angioedema) were associated with the administration of AMEVIVE®. If an anaphylactic reaction or other serious allergic reaction occurs, administration of AMEVIVE® should be discontinued immediately and appropriate therapy initiated. In post-marketing experience there have been reports of liver injury, including asymptomatic transaminase elevation, fatty infiltration of the liver, hepatitis, decompensation of cirrhosis with liver failure, and acute failure. Two cases of liver failure were reported with concomitant alcohol use (see ADVERSE REACTIONS , Hepatic Injury ). While the exact relationship of these occurrences with the use of AMEVIVE® has not been established, patients with signs or symptoms of liver injury should be fully evaluated. AMEVIVE® should be discontinued in patients who develop significant clinical signs of liver injury. In clinical trials, AMEVIVE®-treated patients experienced rare cases (9) of transaminase elevations to 5 to 10 times the upper limit of normal. Patients should be informed of the need for regular monitoring of white blood cell (lymphocyte) counts during therapy and that AMEVIVE® must be administered under the supervision of a physician. Patients should also be informed that AMEVIVE® reduces lymphocyte counts, which could increase their chances of developing an infection or a malignancy. Patients should be advised to inform their physician promptly if they develop any signs of an infection or malignancy while undergoing a course of treatment with AMEVIVE®. Female patients should also be advised to notify their physicians if they become pregnant while taking AMEVIVE® (or within 8 weeks of discontinuing AMEVIVE®) and be advised of the existence of and encouraged to enroll in the Pregnancy Registry. Call 1-866-AMEVIVE (1-866-263-8483) to enroll into the Registry (see PRECAUTIONS , Pregnancy ). Patients should be advised that serious liver injury has been reported in patients receiving AMEVIVE®. Patients should be advised to report to their physician persistent nausea, anorexia, fatigue, vomiting, abdominal pain, jaundice, easy bruising, dark urine or pale stools. CD4+ T lymphocyte counts should be monitored weekly during the 12-week dosing period and used to guide dosing. Patients should have normal CD4+ T lymphocyte counts prior to an initial or a subsequent course of treatment with AMEVIVE®. Dosing should be withheld if CD4+ T lymphocyte counts are below 250 cells/µL. AMEVIVE® should be discontinued if CD4+ T lymphocyte counts remain below 250 cells/µL for one month. No formal interaction studies have been performed. The duration of the period following treatment with AMEVIVE® before one should consider starting other immunosuppressive therapy has not been evaluated. Women of childbearing potential make up a considerable segment of the patient population affected by psoriasis. Since the effect of AMEVIVE® on pregnancy and fetal development, including immune system development, is not known, health care providers are encouraged to enroll patients currently taking AMEVIVE® who become pregnant into the Biogen Idec Pregnancy Registry by calling 1-866-AMEVIVE (1-866-263-8483). Reproductive toxicology studies have been performed in cynomolgus monkeys at doses up to 5 mg/kg/week (about 62 times the human dose based on body weight) and have revealed no evidence of impaired fertility or harm to the fetus due to AMEVIVE®. No abortifacient or teratogenic effects were observed in cynomolgus monkeys following intravenous bolus injections of AMEVIVE® administered weekly during the period of organogenesis to gestation. AMEVIVE® underwent trans-placental passage and produced in utero exposure in the developing monkeys. In utero , serum levels of exposure in these monkeys were 23% of maternal serum levels. No evidence of fetal toxicity including adverse effects on immune system development was observed in any of these animals. Animal reproduction studies, however, are not always predictive of human response and there are no adequate and well-controlled studies in pregnant women. Because the risk to the development of the fetal immune system and postnatal immune function in humans is unknown, AMEVIVE® should be used during pregnancy only if clearly needed. If pregnancy occurs while taking AMEVIVE®, continued use of the drug should be assessed. Of the 1357 patients who received AMEVIVE® in clinical trials, a total of 100 patients were >/= 65 years of age and 13 patients were >/= 75 years of age. No differences in safety or efficacy were observed between older and younger patients, but there were not sufficient data to exclude important differences. Because the incidence of infections and certain malignancies is higher in the elderly population, in general, caution should be used in treating the elderly. The adverse reactions which most commonly resulted in clinical intervention were cardiovascular events including coronary artery disorder in <1% of patients and myocardial infarct in <1% of patients. These events were not observed in any of the 413 placebo-treated patients. The total number of patients hospitalized for cardiovascular events in the AMEVIVE®-treated group was 1.2% (11/876). The most common events resulting in discontinuation of treatment with AMEVIVE® were CD4+ T lymphocyte levels below 250 cells/µL (see WARNINGS , and ADVERSE REACTIONS , Effect on Lymphocyte Counts ), headache (0.2%), and nausea (0.2%). Because clinical trials are conducted under widely varying conditions, adverse event rates observed in the clinical trials of a drug cannot be directly compared to rates in the clinical trials of another drug and may not reflect the rates observed in practice. The adverse reaction information does, however, provide a basis for identifying the adverse events that appear to be related to drug use and a basis for approximating rates. The data described below reflect exposure to AMEVIVE® in a total of 1357 psoriasis patients, 85% of whom received 1 to 2 courses of therapy and the rest received 3 to 6 courses and were followed for up to three years. Of the 1357 total patients, 876 received their first course in placebo-controlled studies. The population studied ranged in age from 16 to 84 years, and included 69% men and 31% women. The patients were mostly Caucasian (89%), reflecting the general psoriatic population. Disease severity at baseline was moderate to severe psoriasis. In the first course of the intravenous study (Study 1), 10% of patients temporarily discontinued treatment and 2% permanently discontinued treatment due to CD4+ T lymphocyte counts below the specified threshold of 250 cells/µL. During the first course of Study 1, 22% of patients had total lymphocyte counts below normal, 48% had CD4+ T lymphocyte counts below normal and 59% had CD8+ T lymphocyte counts below normal. The maximal effect on lymphocytes was observed within 6 to 8 weeks of initiation of treatment. Twelve weeks after a course of therapy (12 weekly doses), 4% of patients had total lymphocyte counts below normal, 19% had CD4+ T lymphocyte counts below normal, and 36% had CD8+ T lymphocyte counts below normal. For patients receiving a second course of AMEVIVE® in Study 1, 17% of patients had total lymphocyte counts below normal, 44% had CD4+ T lymphocyte counts below normal, and 56% had CD8+ T lymphocyte counts below normal. Twelve weeks after completing dosing, 3% of patients had total lymphocyte counts below normal, 17% had CD4+ T lymphocyte counts below normal, and 35% had CD8+ T lymphocyte counts below normal (see WARNINGS , and PRECAUTIONS , Laboratory Tests ). Among 1357 patients who received AMEVIVE®, 25 patients were diagnosed with 35 treatment-emergent malignancies. The majority of these malignancies (23 cases) were basal (6) or squamous cell cancers (17) of the skin. Three cases of lymphoma were observed; one was classified as non-Hodgkin's follicle-center cell lymphoma and two were classified as Hodgkin's disease. In the 24-week period constituting the first course of placebo-controlled studies, serious infections (infections requiring hospitalization) were seen at a rate of 0.9% (8/876) in AMEVIVE®-treated patients and 0.2% (1/413) in the placebo group. In patients receiving repeated courses of AMEVIVE® therapy, the rates of serious infections were 0.7% (5/756) and 1.5% (3/199) in the second and third course of therapy, respectively. Serious infections among 1357 AMEVIVE®-treated patients included necrotizing cellulitis, peritonsillar abscess, post-operative and burn wound infection, toxic shock, pneumonia, appendicitis, pre-septal cellulitis, cholecystitis, gastroenteritis and herpes simplex infection. In clinical studies two patients were reported to experience angioedema, one of whom was hospitalized. In the 24-week period constituting the first course of placebo-controlled studies, urticaria was reported in 6 (<1%) AMEVIVE®-treated patients vs. 1 patient in the control group. Urticaria resulted in discontinuation of therapy in one of the AMEVIVE®-treated patients. In post-marketing experience there have been reports of asymptomatic transaminase elevation, fatty infiltration of the liver, hepatitis, and severe liver failure (see PRECAUTIONS , Hepatic Injury ). In the intramuscular study (Study 2), 16% of AMEVIVE®-treated patients and 8% of placebo-treated patients reported injection site reactions. Reactions at the site of injection were generally mild, typically occurred on single occasions, and included either pain (7%), inflammation (4%), bleeding (4%), edema (2%), non-specific reaction (2%), mass (1%), or skin hypersensitivity (<1%). In the clinical trials, a single case of injection site reaction led to the discontinuation of AMEVIVE®. Approximately 3% (35/1306) of patients receiving AMEVIVE® developed low-titer antibodies to alefacept. No apparent correlation of antibody development and clinical response or adverse events was observed. The long-term immunogenicity of AMEVIVE® is unknown. The data reflect the percentage of patients whose test results were considered positive for antibodies to alefacept in an ELISA assay, and are highly dependent on the sensitivity and specificity of the assay. Additionally, the observed incidence of antibody positivity in an assay may be influenced by several factors including sample handling, timing of sample collection, concomitant medications, and underlying disease. For these reasons, comparison of the incidence of antibodies to alefacept with the incidence of antibodies to other products may be misleading. The highest dose tested in humans (0.75 mg/kg IV) was associated with chills, headache, arthralgia, and sinusitis within one day of dosing. Patients who have been inadvertently administered an excess of the recommended dose should be closely monitored for effects on total lymphocyte count and CD4+ T lymphocyte count. AMEVIVE® should only be used under the guidance and supervision of a physician. The recommended dose of AMEVIVE® is 7.5 mg given once weekly as an IV bolus or 15 mg given once weekly as an IM injection. The recommended regimen is a course of 12 weekly injections. Retreatment with an additional 12-week course may be initiated provided that CD4+ T lymphocyte counts are within the normal range, and a minimum of a 12-week interval has passed since the previous course of treatment. Data on retreatment beyond two cycles are limited. The CD4+ T lymphocyte counts of patients receiving AMEVIVE® should be monitored weekly before initiating dosing and throughout the course of the 12-week dosing regimen. Dosing should be withheld if CD4+ T lymphocyte counts are below 250 cells/µL. The drug should be discontinued if the counts remain below 250 cells/µL for one month (see PRECAUTIONS , Laboratory Tests ). AMEVIVE® should be reconstituted by a health care professional using aseptic technique. Each vial is intended for single patient use only. Do not use AMEVIVE® beyond the date stamped on the carton, dose pack lid (IV), drug/diluent pack (IM), AMEVIVE® vial label, or diluent container label. AMEVIVE® 15 mg lyophilized powder for IM administration should be reconstituted with 0.6 mL of the supplied diluent (Sterile Water for Injection, USP). 0.5 mL of the reconstituted solution contains 15 mg of alefacept. AMEVIVE® 7.5 mg lyophilized powder for IV administration should be reconstituted with 0.6 mL of the supplied diluent. 0.5 mL of the reconstituted solution contains 7.5 mg of alefacept. Do not add other medications to solutions containing AMEVIVE®. Do not reconstitute AMEVIVE® with other diluents. Do not filter reconstituted solution during preparation or administration. All procedures require the use of aseptic technique. Using the supplied syringe and one of the supplied needles, withdraw only 0.6 mL of the supplied diluent, (Sterile Water for Injection, USP). Keeping the needle pointed at the sidewall of the vial, slowly inject the diluent into the vial of AMEVIVE®. Some foaming will occur, which is normal. To avoid excessive foaming, do not shake or vigorously agitate. The contents should be swirled gently during dissolution. Generally, dissolution of AMEVIVE® takes less than two minutes. The solution should be used as soon as possible after reconstitution. The reconstituted solution should be clear and colorless to slightly yellow. Visually inspect the solution for particulate matter and discoloration prior to administration. The solution should not be used if discolored or cloudy, or if undissolved material remains. Following reconstitution, the product should be used immediately or within 4 hours if stored in the vial at 2-8°C (36-46°F). AMEVIVE® NOT USED WITHIN 4 HOURS OF RECONSTITUTION SHOULD BE DISCARDED. Remove the needle used for reconstitution and attach the other supplied needle. Withdraw 0.5 mL of the AMEVIVE® solution into the syringe. Some foam or bubbles may remain in the vial. For intramuscular use, inject the full 0.5 mL of solution. Rotate injection sites so that a different site is used for each new injection. New injections should be given at least 1 inch from an old site and never into areas where the skin is tender, bruised, red, or hard. Prepare 2 syringes with 3.0 mL Normal Saline, USP for pre- and post-administration flush. Prime the winged infusion set with 3.0 mL saline and insert the set into the vein. Attach the AMEVIVE®-filled syringe to the infusion set and administer the solution over no more than 5 seconds. Flush the infusion set with 3.0 mL saline, USP. AMEVIVE® for IV administration is supplied in either a carton containing four administration dose packs, or in a carton containing one administration dose pack. Each dose pack contains one 7.5-mg single-use vial of AMEVIVE®, one 10 mL single-use diluent vial (Sterile Water for Injection, USP), one syringe, one 23 gauge, ¾ inch winged infusion set, and two 23 gauge, 1 ¼ inch needles. The NDC number for the four administration dose pack carton is 59627-020-01. The NDC number for the one administration dose pack carton is 59627-020-02. AMEVIVE® for IM administration is supplied in either a carton containing four doses, or in a carton containing one dose. Each four-dose carton contains one removable drug/diluent pack for refrigeration, four 1 mL syringes, and eight 23 gauge, 1 ¼ inch needles. Each four-dose drug/diluent pack for refrigeration contains: four 15-mg single-use vials of AMEVIVE® and four 10 mL single-use diluent vials of Sterile Water for Injection, USP. Each single-dose carton contains one removable drug/diluent pack for refrigeration, one syringe and two 23 gauge, 1 ¼ inch needles. Each single-dose drug/diluent pack for refrigeration contains: one 15-mg single-use vial of AMEVIVE® and one 10 mL single-use diluent vial of Sterile Water for Injection, USP. The NDC number for the four-dose carton is 59627-021-03. The NDC number for the single-dose carton is 59627-021-04. AMEVIVE® is reconstituted with 0.6 mL of the 10 mL single-use diluent. The dose pack (IV) and drug/diluent pack (IM) containing AMEVIVE® (lyophilized powder) should be stored in a refrigerator between 2-8°C/36-46°F. PROTECT FROM LIGHT. Retain in carton (IV) or drug/diluent pack (IM) until time of use. Bos JD, Hagenaars C, Das PK, et al. Predominance of "memory" T cells (CD4+, CDw29+) over "na[iuml ]ve" T cells (CD4+, CD45R+) in both normal and diseased human skin. Arch Dermatol Res 1989; 281:24-30. Ellis C, Krueger GG. Treatment of chronic plaque psoriasis by selective targeting of memory effector T lymphocytes. N Engl J Med 2001; 345:248-255. Fredriksson T, Pettersson U. Severe psoriasis-oral therapy with a new retinoid. Dermatologica 1978; 157:238-244.